Fans and critics of President Donald Trump agree on one thing: For better or for worse, his first year in office left a huge impact on Alaska and set the stage for bigger change to come. To environmentalists' alarm, Trump helped unlock the door to drilling in the Arctic National Wildlife Refuge, opened a path for mining at the Pebble prospect and moved to roll back Obama-era restrictions. Others appreciate many of the changes, saying they could help Alaska's economy, struggling with the nation's highest unemployment and massive government deficits. Gov. Bill Walker said Wednesday the Trump administration has helped the state advance resource issues critical to Alaska's future, such as drilling in the Arctic refuge coastal plain. Members of the president's cabinet have provided significant help and access for state officials, he said. The Trump administration has also shown support for Alaska's $43 billion gas export project, Alaska LNG, Walker said. On the president's trade mission to Beijing in November, Trump and Chinese president Xi Jinping watched Walker sign a deal that might lead to a major Chinese investment in the project. "This sort of progress speaks for itself and underscores the key role Alaska plays in America's present and future," Walker said. Conservation groups have vowed to mount fierce opposition to Trump's actions in Alaska. But they acknowledge he's made strides in meeting his pro-development goals here. "Some people have said no state has been impacted more than Alaska," said Lois Epstein, Arctic program director for The Wilderness Society. She said the Trump administration has "targeted" the state for maximum oil drilling on federal lands. The changes have been administrative and legal so far, but Epstein said they're significant. The president has laid the groundwork for widespread industrial access, a big shift from the balanced approach of the past that removed some sensitive areas from leasing, she said. A key moment came last week when Trump signed legislation opening ANWR's coastal plain to oil drilling, a first for congressional Republicans after 40 years of attempts. Sen. Lisa Murkowski, R-Alaska, authored the legislation that was included in the tax bill. It allows the first-ever lease sale in the refuge coastal plain, within four years. Murkowski has said any activity there must clear all environmental hurdles. "I'm not saying there will be drilling tomorrow by any means," Epstein said. "But now you have a completely different legal framework governing the refuge. That's a huge change." The Trump administration has also taken steps toward one day allowing drilling on currently off-limits acreage in the National Petroleum Reserve-Alaska and the U.S. Arctic Ocean, Epstein said. No place in Alaska is safe from Trump, said Andy Moderow, Alaska Wilderness League state director. He is moving to undo "a lot of decisions that took years to make following a lot of public process," Moderow said. That includes the Pebble copper and gold prospect that had appeared dead under President Barack Obama, after his Environmental Protection Agency heard public concerns that it would devastate the Bristol Bay salmon fishery. Trump's EPA has lifted the resistance. The project is now advancing with a scaled-back plan critics still fiercely oppose. "The Trump administration is dangerous," Moderow said. "It's showing a lack of regard for what Alaskans want for their future." Forrest Nabors, political science department chairman at the University of Alaska Anchorage, said many Alaskans fear Trump's efforts to kill Obamacare will erode health benefits and boost insurance costs. Also worrisome are the biting tweets Trump has fired at the unpredictable Kim Jong Un across the Pacific Ocean, Nabors said. "We can't forget that Anchorage is the closest major American city to North Korean missile silos, and when the president is publicly tweeting insults to the North Korea regime, that should concern all of us," Nabors said. Still, Nabors said increasing petroleum and business activity in Alaska, perhaps aided by the corporate tax cut Trump promoted, could improve the state's weak economy. "From an economic point of view, we could be back in business in fairly short order," Nabors said. Kara Moriarty, Alaska Oil and Gas Association president, said an "amazing" number of items have been accomplished in Trump's first year. That includes the appointment of Alaskans to key positions, including Joe Balash. The former Alaska Natural Resources commissioner is now an assistant secretary at the Department of the Interior and will oversee the Arctic refuge leasing program. Critics around the world have blasted Trump's provocative personality and erratic behavior. Trump's position on oil and gas has been consistent, Moriarty said. "In the oil and gas industry, we don't focus on personality," Moriarty said. "We focus on policy. He has a policy to make America energy dominant, and Alaska is a key component." 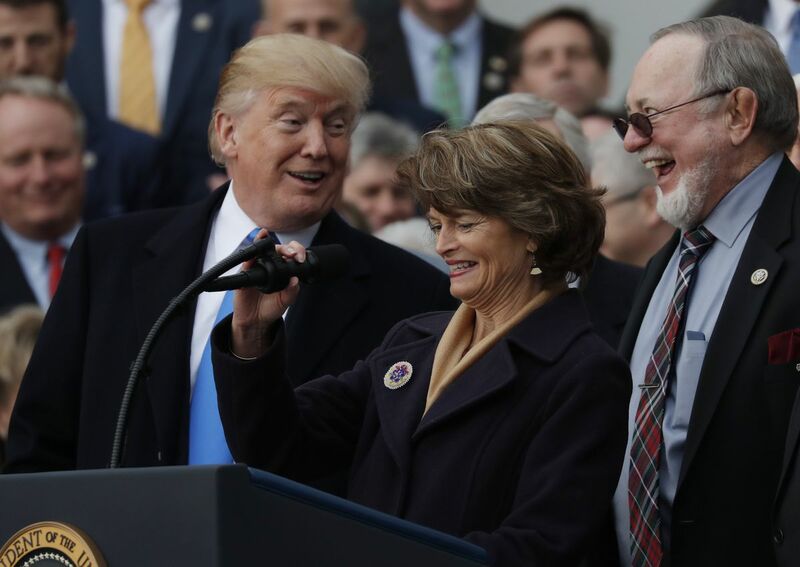 In July, the Trump administration threatened to yank support for Alaska energy issues after Murkowski, citing the closed process, voted against the Republican effort to debate Obamacare repeal. Trump's off-the-cuff tweets suggest he's impatient and maybe a little insecure, said Frank Murkowski, the former Alaska governor who appointed his daughter to fill his U.S. Senate seat in 2002. A tweet in July attacking his daughter — when Trump said the senator let down Republicans and the nation with her health care vote — made him naturally defensive as a father, he said. But it turns out Alaska has done well, he said, adding that some are "euphoric" about the changes since Trump took office in January. "It's been very, very positive," Frank Murkowski said. "Now the challenge we have is convincing a lot of our critics that we can have responsible development."